Rock & Roll: Petty, Aim, Fire! On his new record, Tom Petty targets "the celebration of mediocrity in America"
Several weeks before he'll be inducted into the Rock & Roll Hall of Fame alongside his band, the Heartbreakers, Tom Petty stands in a Hollywood studio working on a new album he describes as "a kind of audio movie" dealing with "the celebration of mediocrity in America." That includes the music business, of course -- the headline of a 1981 ROLLING STONE cover story on Petty was ONE MAN'S WAR AGAINST HIGH RECORD PRICES -- particularly the extravagantly expensive VIP concert seats known as golden-circle tickets. The title of the album, in fact, is The Golden Circle. "I've gotten into this whole golden-circle thing," Petty says, "about how they sell these seats down front at the venues with the names of the big companies. And it drives me nuts." 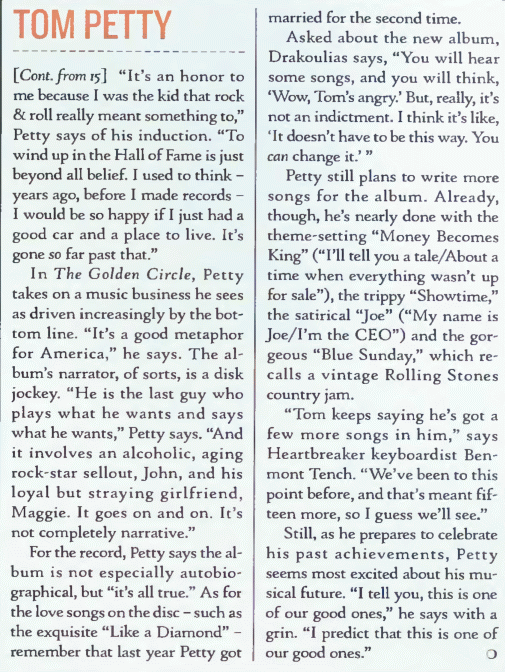 Based on a half-dozen unfinished tracks, the album -- expected to be released in late summer or fall -- makes good on Petty's intention to break some new ground. Petty and the Heartbreakers are recording with producer George Drakoulias (best known for his work with the Black Crowes), but they've also solicited contributions from Lindsey Buckingham of Fleetwood Mac and Jon Brion -- the L.A. musician who has produced albums for Fiona Apple and Rufus Wainwright. Brion provided orchestrations for several of Petty's songs. 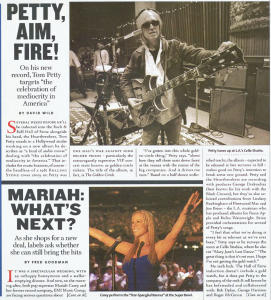 "I feel that what we're doing is every bit as relevant as we've ever been," Petty says as he surveys the room at Cello Studios, where he also cut "Mary Jane's Last Dance." "The great thing is that it's not over. I hope I'm not getting the gold watch." No such luck. The Hall of Fame induction doesn't include a gold watch, but it does put Petty in the company of the rock & roll heroes he has befriended and collaborated with: Bob Dylan, George Harrison and Roger McGuinn. "It's an honor to me because I was the kid that rock & roll really meant something to," Petty says of his induction. "To wind up in the Hall of Fame is just beyond all belief. I used to think -- years ago, before I made records -- I would be happy if I just had a good car and a place to live. It's gone so far past that." 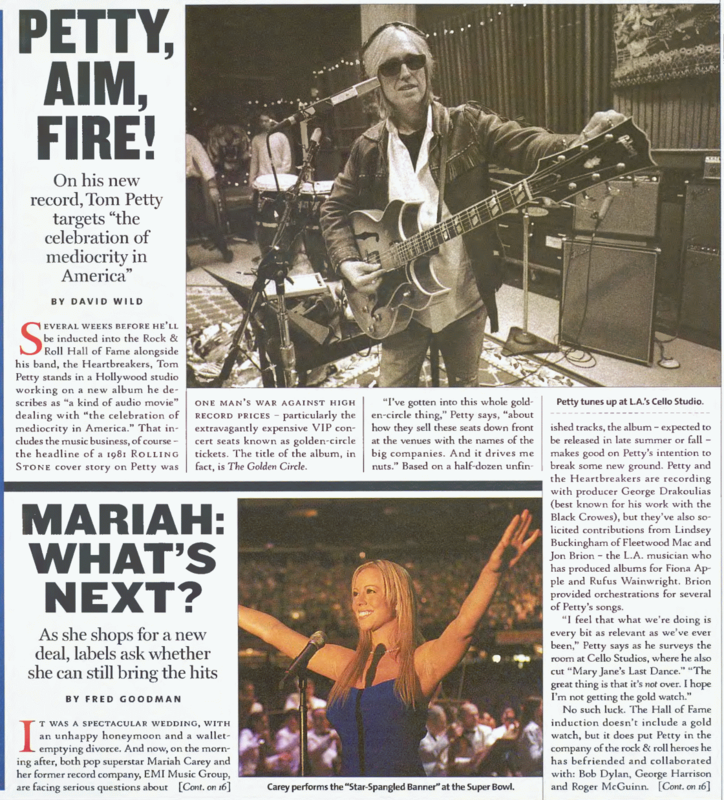 In The Golden Circle, Petty takes on a music business he sees as driven increasingly by the bottom line. "It's a good metaphor for America," he says. The album's narrator, of sorts, is a disk jockey. "He is the last guy who plays what he wants and says want he wants," Petty says. "And it involves an alcoholic, aging rock-star sellout, John, and his loyal but straying girlfriend, Maggie. It goes on and on. It's not completely narrative." 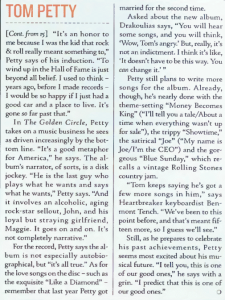 For the record, Petty says the album is not especially autobiographical, but "it's all true." As for the love songs on the disc -- such as the exquisite "Like a Diamond" -- remember that last year Petty got married for the second time. Asked about the new album, Drakouilias says, "You will hear some songs and you will think, 'Wow, Tom's angry.' But, really, it's not an indictment. I think it's like, 'It doesn't have to be this way. You can change it.'" Petty still plans to write more songs for the album. Already, though, he's nearly done with the theme-setting "Money Becomes King" ("I'll tell you a tale/About a time when everything wasn't up for sale"), the trippy "Showtime," the satirical "Joe" ("My name is Joe/I'm the CEO") and the gorgeous "Blue Sunday," which recalls a vintage Rolling Stones country jam. "Tom keeps saying he's got a few more songs in him," says Heartbreaker keyboardist Benmont Tench. "We've been to this point before, and that's meant fifteen more, so I guess we'll see." Still, as he prepares to celebrate his past achievements, Petty seems most excited about his musical future. "I tell you this is one of our good ones," he says with a grin. "I predict that this is one of our good ones."